Citing the “most comprehensive review to date” from the same Center, the Baltimore Sun in 2011 argued that Maryland had made “little progress with Smart Growth” despite adopting laws and policies hailed across the country as models for growth management. One of the innovative policies was the establishment of Priority Funding Areas (PFAs) where development was to be directed and incentivized with money for cash-strapped jurisdictions. Yet the representative bodies closest to the people continued to permit development outside the PFAs. Under the new PlanMaryland, Priority Funding Areas essentially become urban growth boundaries. People still can choose to live outside PFAs, but new housing can be built at no greater than one unit per 20 acres, making such dwellings unaffordable to all but the extremely rich. Ninety percent of new development must be inside the PFAs at a minimum density of 3.5 units per acre. The impact of increased densities is hard to gauge when presented in this manner, but 3.5 units per acre converts to 2,240 units per square mile. Maryland averages 2.62 people per dwelling unit, so the minimum population density for almost all new development will be on a scale of 5,846 people per square mile, a density higher than Portland or San Francisco, and just shy of Copenhagen, Denmark. A later draft, September 2011, established ranges for “medium density” (3.5 to 10 units per acre) and “high density” (10+ units per acre) and repeatedly showed a preference for the high density classification, which converts to a scale of at least 16,704 people per square mile. But a strange thing happened on the road to the final draft: high density was euphemized. The sixteen-page Executive Summary does not once mention density. “Low density” makes numerous appearances in the final draft in the context of wasteful land use patterns, and “high density” appears just once. Instead, PlanMaryland relies on the phrase “compact development”. A comparison table, laughably labeled “Low Density versus Compact Development,” steers clear of medium or high density labels even though, when converted to population per square mile, the “compact” living arrangement would be more than seven times Maryland’s current density. This appears to be lifted from the influential 2007 Growing Cooler report, sponsored by the National Center for Smart Growth Research and Education, Smart Growth America, and other advocacy organizations. The authors call on “all housing growth” to be built at an average density of 13 units per acre (21,798 people per square mile), in order to increase the overall metropolitan density to 9 units per acre (15,091 people per square mile) by the year 2025. There’s not a lot of room for detached single family homes in this scenario. PlanMaryland’s Best Practices section highlights White Flint in North Bethesda for redeveloping “an auto-dominated suburban strip into an environment where people walk to work, shops and transit.” This project puts 1,400 apartments on 32 acres, for a density of 44 units per acre. Hyattsville’s Arts District is recognized because “this mixed-use community features row homes, condominiums, live-work units, shops and a new community center,” but there is no room for detached, single family homes among the 500 dwellings crowded onto 25 acres, or 20 units per acre. Also featured is Carroll Creek Park that has 300 residential units, all multi-family, mixed among commercial and office space along a linear 1.3-mile strip. As a “Traditional Neighborhood Development,” Kentlands is closer to the norm, and features some single family housing among its mix of shops, apartments, and condos, but the 1,655 residential units on 352 acres is still 35 percent higher than the “minimum” densities mentioned in PlanMaryland, and thirteen times the state’s current density level. These places are architecturally striking and aesthetically attractive, but they are unaffordable to most of the state’s population. Furthermore, the dearth of detached single family housing, the predominance of multi-family dwellings mixed with (not nearby) other uses, and dramatically higher densities are not at all what an overwhelming majority of people want in Maryland or anywhere else. The emergence of Smart Growth in Maryland is indicative of the movement in general: For successful implementation, it would be necessary to replace incentives with mandates, and continue to rely on euphemistic language to avoid a candid discussion of density. In October, I spoke -- along with Wendell Cox and a few others -- at a technical forum on PlanMaryland, addressing many areas of concern including density. Signed into law by Governor Martin O’Malley in December 2011, PlanMaryland weakens the authority of local governments, eviscerates property rights, and expresses hope for declining interest in the single family home. Defenders will argue that most people support Smart Growth; after all, O’Malley and others like him were popularly elected. Yet these politicians never campaign on the specifics of Smart Growth, such as how many people per square mile they believe is necessary, or what kinds of restrictions they will impose on single family housing in the suburbs, or the impacts on affordability. The September draft of PlanMaryland said, “PlanMaryland, we believe, is what the public says it wants and deserves in government.” Tellingly, this statement is missing from the final report. That’s because what planners want and what people prefer are starkly different. 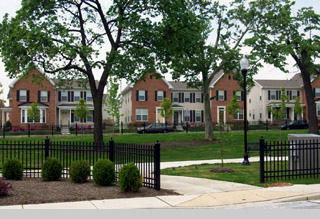 Photo: New residential smart growth, from the state of Maryland's, "Smart, Green, and Growing" site. Submitted by tradizione89 on Tue, 09/24/2013 - 23:02. Submitted by admin00 on Mon, 08/12/2013 - 06:11. Посмотреть This picture is very beautiful.I love my Home. This Home like as my home. A Garden sould be in a beautiful home. Submitted by rawdevid on Thu, 05/23/2013 - 01:24. Submitted by jamuboro on Tue, 05/07/2013 - 23:04. Submitted by davebarnes on Fri, 04/06/2012 - 11:13. I live in a neighborhood in Denver that is designed (according to the new form-based zoning plan) to have a density of 18K/sqmi. Yet, it does seem dense to me at all. It seems very street-car suburban and low density. Of course, you need money to live here with the lowest-priced new house going for $425K. The exurbs are much cheaper. Submitted by hayasidamegumi. on Wed, 11/21/2012 - 22:54. Submitted by hayasidamegumi. on Sat, 11/24/2012 - 00:28.
my own project within the school, and possesses exact same topic using your.. Excellent post. I am find information on this topic as I am working on a business project. Submitted by jamuboro on Fri, 05/24/2013 - 01:04. Submitted by tradizione89 on Thu, 07/25/2013 - 22:22. Submitted by sonick67 on Mon, 09/23/2013 - 23:45.